The Cluedo slot game from Wagerworks brings to life on the reels one of the most popular board games. As in the board game, players are required to solve the murder of the lord of the manor. The six murder suspects and the six weapons form exquisitely crafted symbols on the reels. The suspects are Miss Scarlett, Professor Plum, Mrs. Peacock, Colonel Mustard, Mrs. White and Reverend Green. The murder weapons have been superimposed on high-value cards. They are Revolver, Dagger, Spanner, Rope, Lead Pipe and Candlestick. 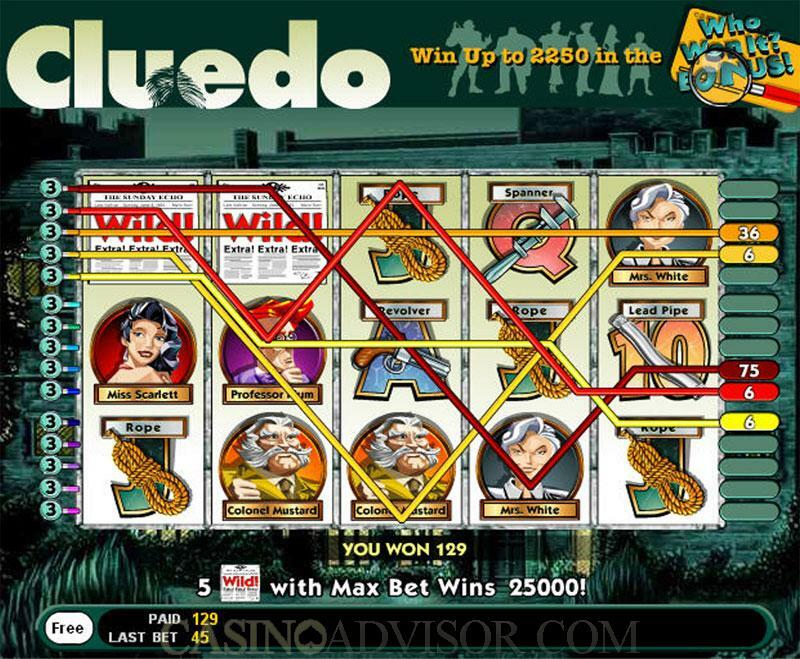 The Cluedo Logo offers large fixed jackpots. The Wild symbol substitutes for all symbols except the bonus symbol. Three Bonus symbols anywhere on a payline trigger the bonus game. In the Cluedo slot game the coin size is fixed at 1.00. Players can choose up to 15 paylines by clicking the button next to the payline. The players have completed control over which paylines to choose. Not only that, players can choose how many coins to wager on each payline. The number of coins can vary between 0 and 5. Players who want to follow the more common practice of enabling all paylines with equal number of coins on each payline can use the buttons provided below the reels. One of the few customization options provided in this slot game is turning the audio on or off. However players are advised to keep the audio on. 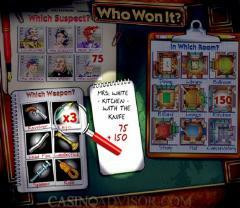 Players can play Cluedo for free or with real money. Five Wild symbols in a payline with maximum bet of 75 credits result in a total payout of 25,000 credits. The next highest jackpot is provided by the Cluedo Logo. 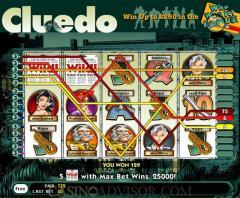 Five Cluedo Logo symbols in an enabled payline offered a payout of 2500 coins. The Cluedo Logo symbol is much sought after because even a single symbol appearing on the first reel doubles the line bet. This symbol can be substituted by the Wild symbol, which is another advantage. The best feature of Cluedo is the "Who Won It?" bonus game. The six murder suspects, the nine murder locations and the six murder weapons are displayed with their values. A magnifying glass moves over each set in turn and selects one item from each set. 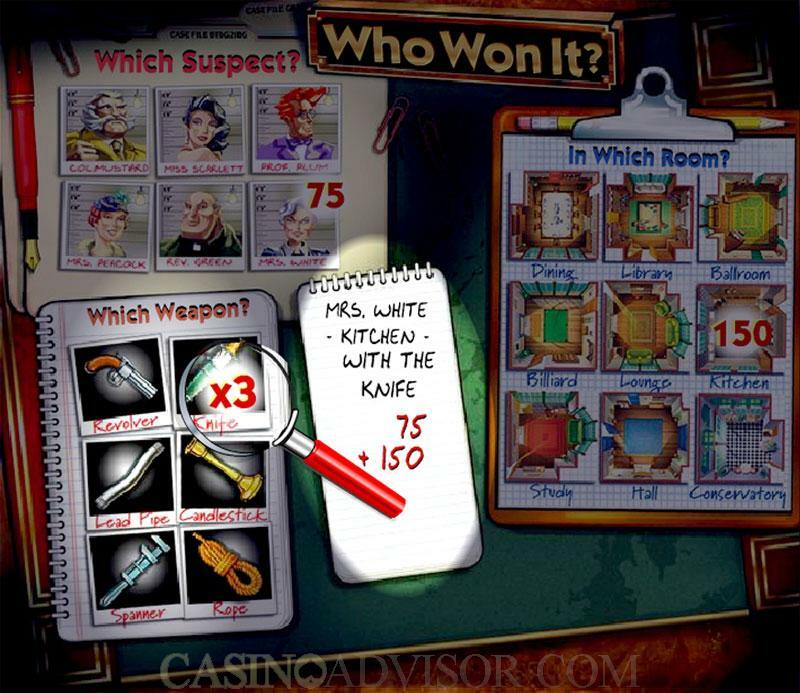 The values of the murder suspect and location are then added up and multiplied by the value of the murder weapon to give the player’s final score. The player can either accept this score or try again for a better score. A player can reject the given score twice but then he has to accept whatever he gets the third time around. Players are advised to wager with larger total bets because that leads to higher scores in the bonus game. Interested in reading more detailed information about Cluedo? If so Click Here for more details.